Sooooo… if you’ve followed my blog for a long time, you may know just how much I love prints. Like, honestly, I just love a good quote, beautifully written on a piece of card, on my wall. In fact, I’ve always loved a good quote on the wall. Before I discovered what prints were, I used to write out my favourite quotes on bits of paper and stick them on my wall with blu tac (I’m cringing now, but I really did!). So, when I saw VeryVez advertising a collaboration opportunity on Instagram, I just HAD to apply! And, I’m excited to announce, that I will be working with them on Instagram for the next 3 months! VeryVez is a small business, ran through etsy, with really uplifting and pretty products! I already cannot wait to order some more of these prints to decorate my new room with! 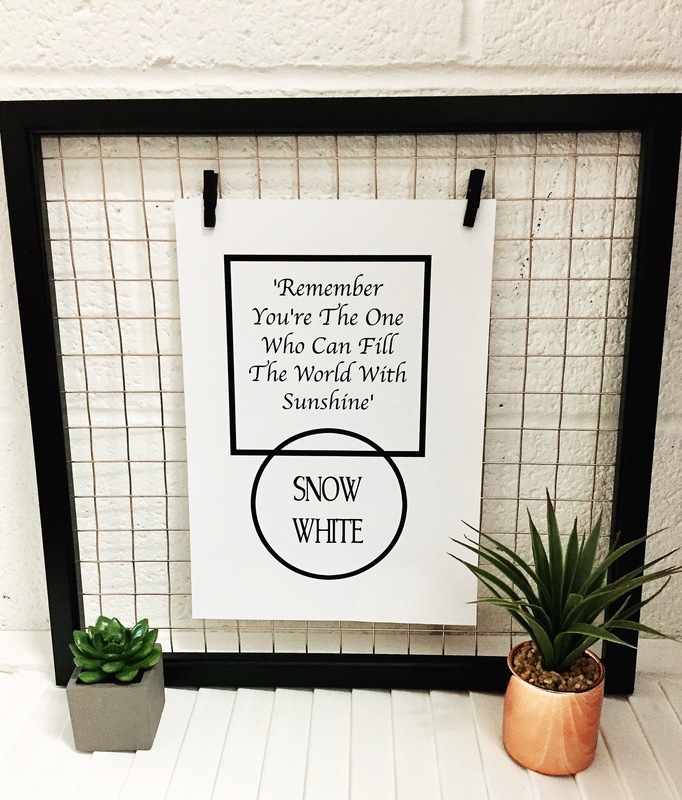 The first print that I chose was a quote from Snow White. 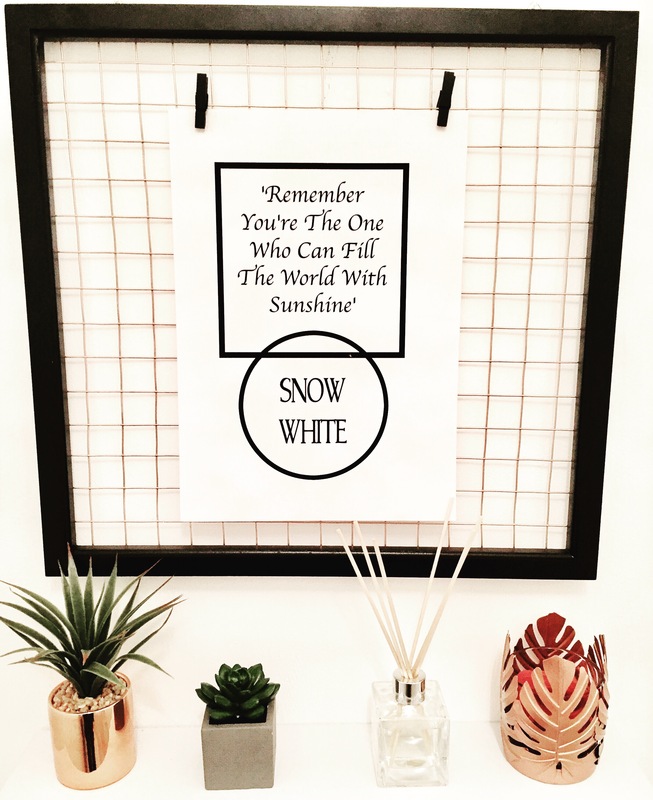 I love Disney but, if I’m honest, I don’t think I could quote Snow White off of the top of my head. However, I absolutely LOVE this quote, as it’s just so happy and inspiring! This unique frame is from Primark, and I think it suits this quote perfectly. Plus, it looks amazing in my freshly painted and decorated bathroom. I just know that reading this quote every morning will make me feel uplifted, as it’s just so inspiring! The print itself is exactly the quality that you would expect, and there’s lots of different styles of prints on the VeryVez etsy store, something to suit everyone’s taste! If you would like to order this, or any other, print from the VeryVez store, you can use my discount code ‘HAYLEY10’ to receive a 10% discount! Do you have prints around your home? What’s your opinion on motivational quotes? Let me know in the comments! *Print sent in exchange for review. For more information, read my Disclaimer. Well done on this collab, I love the Snow White quote. Like you, I can’t resist a good quote on pretty paper! Awww what a cute quote! Love how it looks and how you’ve got it set up! I love a good print – I could buy so many on Etsy if I had the money! These look SO cute – I’ll have to add them to my wishlist! I really like how you took the photos in this post too! I always love discovering new Etsy shops! It’s great that VeryVez are collaborating with bloggers and are being so proactive about it! 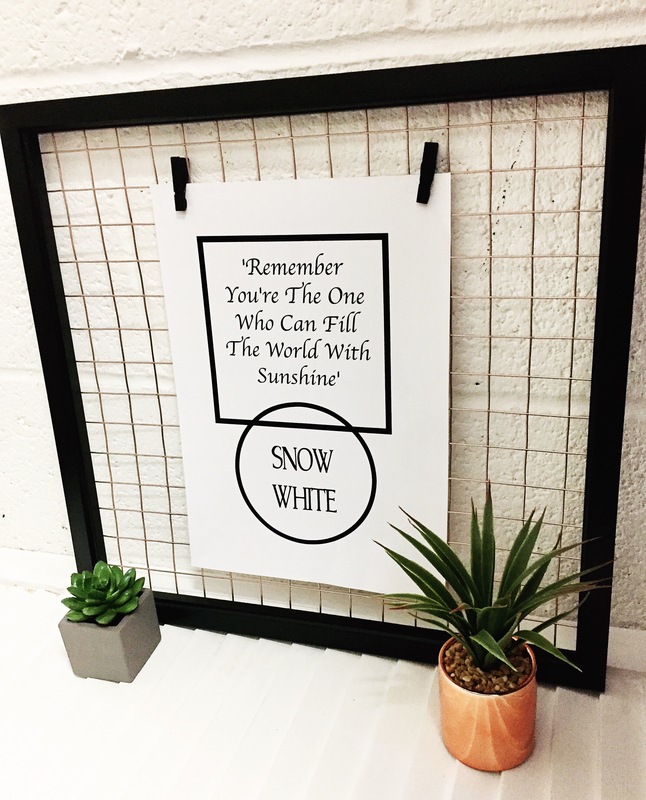 I really like the Snow White quote, it is presented so simply but effectively in the print! Can’t wait to see where your collaboration takes you! Previous Post Cooking with 'One Pound Meals' by Miguel Barclay!